I’ve just bought a second hand Mendel90 and feeling a little out of my depth. The printer was already constructed and had been used on a Windows PC. I’m trying to set it up on my IMac and struggling. 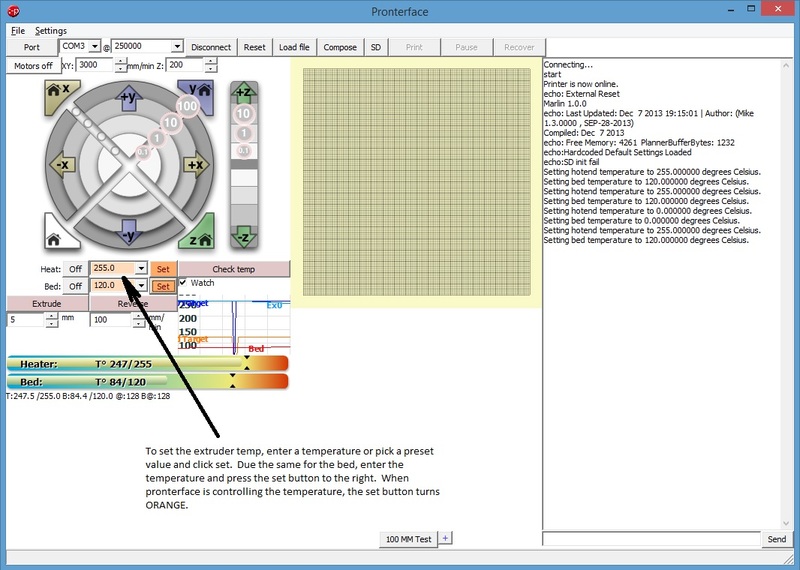 I’ve installed Pronterface and it can move the printer extruder head and bed but it doesn’t have any temp control option etc. I’m not sure I’ve installed the firmware properly as I’m pretty unfamiliar with the Arduino IDE. Does anyone have any hints/tips or links to a walkthrough for setup? Thank you! I now have the temp working - but I don't have the temp bars as shown on your screenshot, it is working though. Just need to work out the next steps. So I now have Pronterface up and running and connected to the printer. I've uploaded a STL file sliced in Cura and tried to print but the print started with the extruder in mid air. I've double checked the x, y & z axis and they seem to be moving in the wrong direction when moved manually in Pronterface, any ideas? This printer had been set up and running on a Windows PC perfectly well, would setting up on a Mac change things? and change as needed from true to false or false to true. But often people think its wrong when its not, You have to think "in relation to the hot end"
X and Z are normally as you think they should be but y , because the bed moves in Y and the head is Fixed in the Y direction, moving Y + moves the bed in Y - direction. Z + moves head up, Z - moves head down. Mendel 90 is sort of backwards. I.e. those directions are correct when viewed from the back of the machine. Since the origin is in the middle of the bed it doesn't make much difference. If it starts in mid air then the Z axis is not calibrated. At Z = 0 the nozzle should just touch the bed (when it is hot). See the manual here for calibration instructions applicable to the firmware it shipped with. This old wooden mendel 90 i'm resurrecting from the dead will be 'non standard' then... Since i'm making it reprap standard 0,0,0 at front left, down. and setting the X and Y endstops as max endstops. Yes I probably should have done that. I didn't realise it was backwards until many had been sold. The only difference it makes when the origin is the centre is the bed contents are rotated with respect to the slicer / host view. It looks like x, y axis are correct. Still trying to troubleshoot the z axis. I can’t bring down the extruder head more than a few mm from the top even using the bar on Printrun. Same problem on both Mac and Windows OS. The firmware was working fine for the previous owner. Edited 1 time(s). Last edit at 07/22/2018 06:21AM by Zaly. What position does M114 return? Looks like all the switches are closed, i.e. not triggered. If it thinks Z is 0 it won't allow it to go any lower. What values do you get when you home the axes? X and Y should be -100 and Z about 202 when the limit switches are triggered. Edited 1 time(s). Last edit at 07/22/2018 06:15PM by nophead. How would I find those values? I haven't been able to home the z axis as it tries to home above the frame, I think I may have already caused damage to the thread as it tried to home above the frame and then wouldn't respond to any commands to pause. I had to switch the printer of by the switch. I've just tried to home the y axis also and it tries to home the bed beyond the frame also so I think the end stops are completely out. You can test the limit switches by pressing them manually and typing M119. They are connected normally closed, so if a connection breaks they trigger, so it is hard to see why it would try to go past the endstop unless it somehow misses the switch. I am assuming you haven't changed the firmware? It's very odd that it would work on Windows but not on a Mac as these sorts of issues are due to wiring and firmware, not the host platform and software. Sorry for the late reply, had a family member taken into hospital so been all over the place! I didn't make any changes to the firmware, loaded it straight up from the USB. They should change to H if they are pressed while M119 is typed. The switch should open and the input pulled high. >I didn't make any changes to the firmware, loaded it straight up from the USB. Not sure what you mean by that. It should have had firmware already installed and be ready to use. Did you load new firmware via USB using the Arduino IDE? If so where did you get it from? Nope, definitely didn’t change to H, I copied and pasted the output exactly as it displayed in Printrun. Sorry the firmware was installed! The Printrun software was on the USB and the manual. The Y axis switch is attached to the front right Y bar clamp. You would need to push the bed towards the back to see it. So if the X switch is working does homing move towards it and stop when it hits it? Note that the switches only stop the axis motion during homing. After that it knows the position and limits movement in firmware, so should not be able to hit the switch again. Thank you - found the y axis and that one's working too. Yes, homing the X axis is working, it moves towards then stops once its triggered the switch. The y axis isn't working though and the bed tries to move beyond it, and I had to turn off the printer to stop it. Sometimes, due to a build up of hole clearances it is possible the carriage hits the left bar clamp before the switch activates. In that case loosen the two font bar clamps, one at a time and slide the left one forwards and the right one backwards. Odd you would need to do this if the machine had been previously working though. Edited 1 time(s). Last edit at 07/26/2018 07:14AM by nophead. Just had a look and it definitely hits the trigger first, not sure why that isn’t stopping it as clearly the triggers are working. Also not sure why the z axis is homing upwards and not on the bed. No I don't know why it doesn't stop either if M119 reports H when the bed is fully forwards.